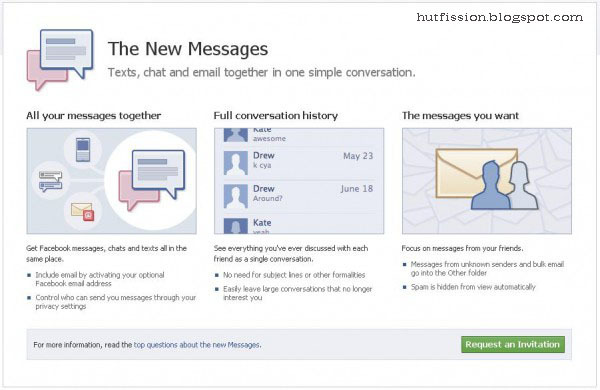 Facebook has released the new Facebook Messages. Facebook Messages allows us to use an email address which can communicate to other email providers, like Gmail, Yahoo, etc. Because, the old Facebook Messages can only be used internally with other Facebook users. Today, Facebook Messages is ready to use and available for us, but this hasn’t been opened to all users of Facebook. So, you must request an invitation to use Facebook Messages. It’s very easy, just point your browser to http://www.facebook.com/about/messages/ and click “Request an Invitation” button at the bottom right.It will send a invite mail to you soon.